Jordy Liz Blogs: If we were having coffee. I am having coffee with my friend Jen next week. I've tried to be more intentional with friendships this year, making time to meet face-to-face and talk one-on-one. If I had all the time (and frequent flyer points) in the world, I would meet for coffee with each and every one of you. ...I would opt for decaf. ...I would tell you that the last two weeks and this one have been so incredibly busy that we haven't had a night (or weekend) of nothing. While I love busy, it catches up to this tired body fast. ...you would maybe catch a glimpse of a little bump, but more so if it was the end of the day and my belly was full. ...you would probably ask me when we are finding out if the baby is a girl or a boy, since that's the next ultrasound on the calendar. I would tell you that we're not. Because we're crazy. ...I would actually tell you that the truth is my husband is the crazy one and believes in spontaneity and surprises. As an avid planner, I am taking this opportunity to learn how to let go of control and embrace neutral. ...I would tell you that since I am learning to embrace neutral, I am buying anything not-too-boy-and-not-too-girl-and-not-just-green-or-yellow I find at Target. This might make my husband change his mind. ...I would tell you that my heightened emotions can make me excited, angry, overwhelmed, calm and exhausted all at the same time. Unfortunately, my husband gets the first glimpse of this. ...I might tell you that I don't know how much longer I want to live in Arizona. But I also know it's not up to just me. It could also just be because we are coming off of an extremely hot and miserable summer. ...I would admit that some days having a baby in six and a half months is so beyond overwhelming and I don't know how it's going to work or what to do. And some days, I wish it was happening sooner. ...I'd probably show up in a sundress because all of my pants are just a bit too snug these days. ...I might have a snack with my coffee because apparently pregnancy makes me lightheaded if I don't eat every two hours. The incident where I almost passed out at the post office this weekend and called my husband in tears? Yeah, I don't want that to happen again. So I keep eating. ...you would see that emotions and symptoms aside, I am very, very excited. And that's what we would talk about, if not more. 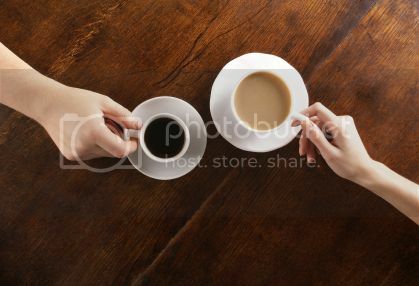 This post was inspired by Amanda's post, "Coffee Date." This totally made me tear up because as I took a moment to get caught up on your blog, I thought to myself "I wish I could know all this stuff over a coffee date like the old days". And then you wrote just like we were. I miss you so much and am so excited for you and Chris. Oh and if we were having coffee, I would go ahead and order a snack with you (you know just because I'm a good friend and all...). Love this post! It's a great little way to get to know you :) So excited for you and that baby bump!